» Night Vision: what is a “strige”? Night Vision: what is a “strige”? So first of all, yes, I did make up this creature. I started, as I mentioned in my earlier post, with a ‘scene’ in mind, of a person who liked to climb trees and rooftops. And I thought: something about that is bird-like. Owl-like, really. “Srix” is a genus of the family strigadae – true owls. But “Roman blood drinking strix”? That had to be investigated! After some more time (okay way too long) searching online, I pieced together the myth of the Strix. In doing so, I also found references to the Romanian Strigoi, Both myths were similar – vampires, essentially, that could transform into an animal (usually an owl). These myths are not widely known, which increased their appeal, for me. Armed with my research, I began inventing my character: the strige. The strige is an emotional vampire. So he or she does not drink blood, in fact, my Strige Theron eats normal food, and enjoys cooking. But to feed the strige part of himself, he must also consume emotions. So he hunts, which means he sneaks around climbing trees and observing humans, and he absorbs the emotions they exude. 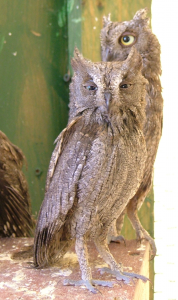 Strige are nocturnal, but can tolerate daylight if necessary. They live longer than humans, but are not immortal. I added some other details to my creature as well, including a bonding ceremony, and I hope you will read the story to learn more about the strige! What kind of creature would you make up? What kinds of paranormal creatures do you most like to read? It sound like you had to do a lot of research for this book, is that something you like or do you feel it’s like a burden but you have to do it? I also think sometimes the research can give you new ideas and new directions for the plot, so it is both fun and useful that way. I love owls and you have me kind of fangirling right now. I’ve already put it on my wishlist just because you associated it with owls and provided great owl pics (in this and the previous post. Freaking awesome!). I love shifter stories and a majority of the time I’m going to want to read a werewolf story. I love owls too, they are fierce and cute at the same time, which is really amazing. How fascinating about the strix. I like to read about all kinds of paranormals e.g. shifters (all kinds, the unusual ones really catch my interest even more, such as the owl in your story), fae/elves, mages/wizards/witches, dragons, vampires etc. I love mythical creatures and I have current interest in Japanese mythology, especially the Kitsune and the intriguing fire breathing 6 ft chicken called the Basan. What an interesting character! I love dragons, myself.